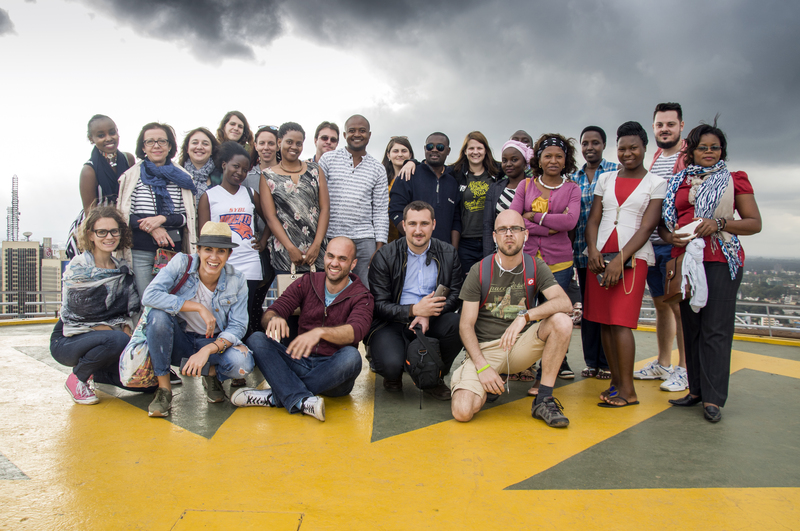 Within the two-year project Active 4 future, supported by the Erasmus + program, Youth center Celje organized a training of youth workers in Nairobi, the capital of Kenya, which took place between 17th and 24th of May 2016. Training involved 29 youth workers and coordinators of the project from Kenya, Uganda, Tanzania, Romania, Bulgaria and Slovenia. The purpose of the training was to train youth workers for supporting young people in implementation of youth initiatives and to share good practices of all the partners involved in the project. All partners had covered part of the structure of youth initiatives and prepared activities for training and implemented them as part of the training program. Based on best practices from all partners, the training was implemented by all participants with a goal that the best practices of one environment can also tested in other environments. Especially rich was the concrete work on the development of youth initiatives and intercultural cooperation, which was established during the work. On the training youth workers gained both, knowledge of development and structuring youth initiatives, learned about the methods and approaches of providing support in the form of youth work, gained tools for working with young people and learned about the elements of coaching, effective communication and management. Full training was oriented in the structuring and defining learning outcomes of individual activities and ways of promoting and developing corporate skills of youth. Based on the implemented training, youth workers gained the necessary knowledge, tools and experience to execute local youth activities, where each partner country executes workshops and discussions on the topic of youth initiatives. The results of this are carried out projects of youth initiatives which will be involved in local group activities. Experience gained in implementation and development of youth initiatives, will be also exchanged by youth from all the countries involved in the project at the Youth Exchange in September 2016 in Celje. One of the participants was David Šoštar, the project manager in Youth center Celje, who shared his take on the training. “Organization and content of the training was very well set, also the theme of the training was very interesting – building support of youth workers in the implementation of youth initiatives. During the training I renewed my knowledge, that every youth worker must master, and in addition I learned some new things and enhanced my competences (communication in mother tongue, communication in foreign languages, digital competences, team work, conflict resolution, management of youth organizations, learning to learn, project finances, key elements of youth initiative, what is a youth initiative, how to evaluate a project, what is entrepreneurship, entrepreneur profile and youth worker profile). I was especially impresses by the skills of youth workers in Kenya, Uganda and Tanzania. Their reality of youth work implementation is very different from our own, European reality at least as far as actual content of work and projects goes. The visit of the Kibera slum and local kindergarten has left a strong cultural and emotional shock on me (approximately 800.000 – 1.000.000 people live in the slum). The visit has opened a whole new view on the world and perception of the environment (houses or so-called homes are made out of mud, wooden boards and polyvinyl, sewers do not exist, conditions are unworthy for human beings). On the other hand, I was pleasantly surprised by the African international evenings because they have really opened my eyes into a brand new world of customs, traditions and culture (in the Uganda evening we performed wedding ceremony and wore their traditional clothes, which we later received as gift). In summary, regardless of that the African countries are less developed, I am glad that I attended the training, because it opened a new view on the world, and at the same time I gained some new knowledge and ideas on how to help young in the local environment to develop and strengthen their skills, how to follow learning outcomes and how to encourage young to be more active. Youth center Celje has started with implementation of Active for future project on 1st of October 2015, with cooperation of six countries, three of which are African. The aim of the project, which in addition to Youth center Celje also participates Uganda Youth Skills Training Organization from Uganda, Volunteer Action for Change Kenya from Kenya, National Management School from Bulgaria, Romanian Youth Forum from Romania and Amsha Institute for Rural Entrepreneurship from Tanzania is to develop skills, knowledge and abilities of young people in order to increase their employment opportunities.